The Haigood & Campbell in Aledo, as a propane marketer, you have a tremendous opportunity to grow your gallons by helping farmers and others in the agriculture industry cut energy costs, increase efficiency, and meet their carbon emissions goals by switching from diesel fuel and gasoline to propane. Just consider this: on average, new propane-fueled farm technology like irrigation engines will consume 4,000-12,000 gallons running approximately 1,000 hours per year depending on the size and application. 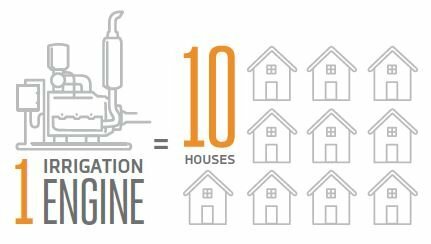 Put another way, a single irrigation engine consumes the same number of gallons as 10 average households. Even better, this usage occurs during the off-peak summer months. Like any business owner, farmers have to keep a close eye on their bottom line, a job that has become increasingly difficult given unpredictable fuel costs. The rising price of gasoline and diesel has forced farmers to consider cheaper, more efficient alternative fuels. That’s part of the reason why approximately one billion gallons of propane were used in agriculture in 2009, representing 10 percent of total odorized propane sales. The competitive price of propane is a valuable proposition for an industry that is greatly dependent on energy intensive equipment. A monthly or annual fuel contract can be very attractive to a farmer. The contract helps minimize price volatility, allows farmers to project their annual fuel costs, and alleviates anxiety about unforeseen spikes in prices commonly experienced with gasoline and diesel. But aside from helping farmers lower their fuel costs, propane is beneficial to farmers in other ways, too. The Propane Education & Research Council (PERC) has spearheaded the development of new propane-fueled technology like high-efficiency irrigation engines that offer lower maintenance costs, reduced emissions, and a smaller price tag. Plus, farmers can increase their cost savings even further by enrolling in the Propane Farm Incentive Program. Sponsored by PERC, the program provides a financial incentive up to $5,000 toward the purchase of new propane fueled farm equipment like irrigation engines and grain dryers. In exchange, participants agree to share real-world performance data with PERC. In fact, participants in the 2013 program who purchased their propane-fueled irrigation engine to replace another engine reported reducing their fuel costs per hour by nearly 56 percent compared with previously owned diesel-fueled engines. This program can deliver significant value for two reasons: first, it can help you grow more gallons because the incentive provides farmers with an attractive motivator to use new propane-fueled equipment; and second, it can help farmers avoid the hassle and cost associated with the Environmental Protection Agency’s (EPA) impending Tier 4 regulations for diesel-fueled equipment. The EPA’s Tier 4 regulations are a component of a federal law called the Clean Air Act. Tier 4 puts increasingly stringent emissions regulations on diesel engines, requiring deep reductions in pollutants and particulate matter. Diesel engines on farms must meet all Tier 4 standards by 2015, which means farmers must adopt more efficient, cleaner technology. Some may choose to do that by retrofitting diesel engines with costly emissions equipment. Others may look into replacing them with new diesel engines. But the price of new diesel engines is rising, as diesel engine manufacturers add expensive components to their engines to comply with Tier 4. Today’s propane-fueled irrigation engines easily meet Tier 4 emissions standards and do so without compromising performance, power, or productivity. Now that you know the opportunity for more gallons exists in the agriculture market, let’s take a closer look at the types of farming operations that employ propane-fueled equipment. An operation that uses land exclusively for growing crops like barley, sorghum, wheat, corn, rice, rye, canola, and soybeans. Flame weed control(often for organic producers). An operation that uses land exclusively for the production of grass, legumes, or other herbaceous plants that will be harvested and sold to livestock owners for animal feed. An operation that uses land to raise and care for livestock. An operation that uses land to raise and care for dairy cows. An operation that involves two or more types of farming like livestock and crop farming, in which a tract of land would be specified for grazing purposes, while another would be used to grow crops or hay. For more information, please visit us at haigood-campbell.com.